Object handling generic submission, CSRF protection, layout and other logic for UI forms. 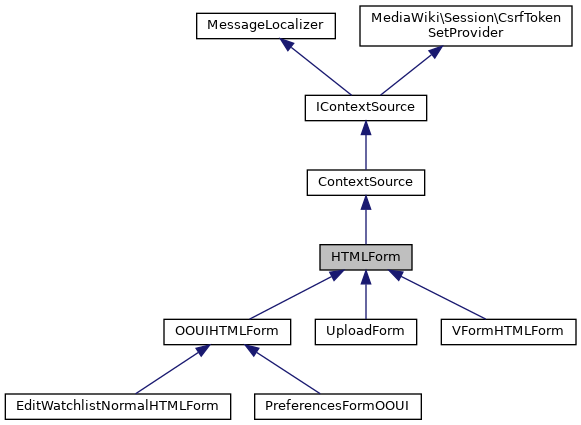 In order to generate the form, the HTMLForm object takes an array structure detailing the form fields available. Each element of the array is a basic property-list, including the type of field, the label it is to be given in the form, callbacks for validation and 'filtering', and other pertinent information. Field types are implemented as subclasses of the generic HTMLFormField object, and typically implement at least getInputHTML, which generates the HTML for the input field to be placed in the table. 'class' – the subclass of HTMLFormField that will be used to create the object. NOT the CSS class! 'type' – roughly translates into the <select> type attribute. if 'class' is not specified, this is used as a map through HTMLForm::$typeMappings to get the class name. 'default' – default value when the form is displayed 'nodata' – if set (to any value, which casts to true), the data for this field will not be loaded from the actual request. Instead, always the default data is set as the value of this field. 'id' – HTML id attribute 'cssclass' – CSS class 'csshelpclass' – CSS class used to style help text 'dir' – Direction of the element. 'options' – associative array mapping raw text labels to values. Some field types support multi-level arrays. Overwrites 'options-message'. 'options-messages' – associative array mapping message keys to values. Some field types support multi-level arrays. Overwrites 'options' and 'options-message'. 'options-message' – message key or object to be parsed to extract the list of options (like 'ipbreason-dropdown'). 'label-message' – message key or object for a message to use as the label. can be an array of msg key and then parameters to the message. 'label' – alternatively, a raw text message. Overridden by label-message 'help' – message text for a message to use as a help text. 'help-message' – message key or object for a message to use as a help text. can be an array of msg key and then parameters to the message. Overwrites 'help-messages' and 'help'. 'help-messages' – array of message keys/objects. As above, each item can be an array of msg key and then parameters. Overwrites 'help'. 'help-inline' – Whether help text (defined using options above) will be shown inline after the input field, rather than in a popup. Defaults to true. Only used by OOUI form fields. 'required' – passed through to the object, indicating that it is a required field. 'size' – the length of text fields 'filter-callback' – a function name to give you the chance to massage the inputted value before it's processed. HTMLFormField::filter() 'validation-callback' – a function name to give you the chance to impose extra validation on the field input. Definition at line 133 of file HTMLForm.php. Build a new HTMLForm from an array of field attributes. Definition at line 326 of file HTMLForm.php. References ContextSource\$context, $section, as, ContextSource\getConfig(), null, and ContextSource\setContext(). 1.27 takes an array as shown. Earlier versions accepted 'name', 'value', 'id', and 'attribs' as separate parameters in that order. Custom labels ('label', 'label-message', 'label-raw') are not supported for IE6 and IE7 due to bugs in those browsers. If detected, they will be served buttons using 'value' as the button label. label-message: (string, optional) Button label message key to use instead of 'value'. Overrides 'label' and 'label-raw'. label: (string, optional) Button label text to use instead of 'value'. Overrides 'label-raw'. label-raw: (string, optional) Button label HTML to use instead of 'value'. id: (string, optional) DOM id for the button. attribs: (array, optional) Additional HTML attributes. flags: (string|string, optional) OOUI flags. framed: (boolean=true, optional) OOUI framed attribute. Definition at line 973 of file HTMLForm.php. References $args, $data, and null. Referenced by SpecialBotPasswords\alterForm(), and McrUndoAction\alterForm(). Add footer text, inside the form. Definition at line 842 of file HTMLForm.php. Definition at line 787 of file HTMLForm.php. Referenced by SpecialChangeEmail\alterForm(), SpecialBlock\alterForm(), and UploadForm\getDescriptionSection(). Add a hidden field to the output. Definition at line 924 of file HTMLForm.php. Referenced by McrRestoreAction\addStatePropagationFields(), McrUndoAction\addStatePropagationFields(), RollbackAction\alterForm(), RevertAction\alterForm(), and MarkpatrolledAction\alterForm(). Definition at line 941 of file HTMLForm.php. Referenced by SpecialPasswordReset\alterForm(), and SpecialChangeEmail\alterForm(). Add text to the end of the display. Definition at line 896 of file HTMLForm.php. Definition at line 762 of file HTMLForm.php. Display the form (sending to the context's OutputPage object), with an appropriate error message or stack of messages, and any validation errors, etc. You should call prepareForm() before calling this function. Moreover, when doing method chaining this should be the very last method call just after prepareForm(). Definition at line 1032 of file HTMLForm.php. Referenced by show(), and showAlways(). array|HTMLFormField $fields Array of fields (either arrays or objects). string $sectionName ID attribute of the "<table>" tag for this section, ignored if empty. string $fieldsetIDPrefix ID prefix for the "<fieldset>" tag of each subsection, ignored if empty. bool &$hasUserVisibleFields Whether the section had user-visible fields. LogicException When called on uninitialized field data, e.g. When HTMLForm::displayForm was called without calling HTMLForm::prepareForm first. Definition at line 1681 of file HTMLForm.php. References $displayFormat, $html, $section, $value, as, Sanitizer\escapeIdForAttribute(), formatSection(), getDisplayFormat(), getFooterText(), getHeaderText(), getLegend(), null, and wrapFieldSetSection(). Referenced by PreferencesFormOOUI\getBody(), and getBody(). May return a HTMLForm subclass. mixed $arguments,... Additional arguments to pass to the constructor. Definition at line 301 of file HTMLForm.php. Referenced by SpecialActiveUsers\buildForm(), SpecialNewFiles\buildForm(), SpecialBookSources\buildForm(), SpecialAutoblockList\execute(), SpecialAllMessages\execute(), SpecialExport\execute(), SpecialBlockList\execute(), SpecialUnblock\execute(), SpecialComparePages\execute(), LinkSearchPage\execute(), SpecialPagesWithProp\execute(), FileDuplicateSearchPage\execute(), SpecialNewpages\form(), AuthManagerSpecialPage\getAuthForm(), LoginSignupSpecialPage\getAuthForm(), FormAction\getForm(), FormSpecialPage\getForm(), ImageListPager\getForm(), WithoutInterwikiPage\getPageHeader(), MIMEsearchPage\getPageHeader(), UsersPager\getPageHeader(), CategoryPager\getStartForm(), SpecialExpandTemplates\makeForm(), SpecialPrefixindex\namespacePrefixForm(), HistoryAction\onView(), SpecialAllPages\outputHTMLForm(), SpecialTags\processCreateTagForm(), SpecialEmailUser\sendEmailForm(), SpecialTags\showActivateDeactivateForm(), SpecialTags\showDeleteTagForm(), SpecialPermanentLink\showForm(), SpecialDiff\showForm(), SpecialProtectedpages\showOptions(), LogEventsList\showOptions(), SpecialProtectedtitles\showOptions(), EmailConfirmation\showRequestForm(), SpecialPreferences\showResetForm(), SpecialTags\showTagList(), SpecialUploadStash\showUploads(), HTMLRestrictionsFieldTest\testForm(), and SpecialEmailUser\userForm(). Overload this if you want to apply special filtration routines to the form as a whole, after it's submitted but before it's processed. Definition at line 1861 of file HTMLForm.php. Format a stack of error messages into a single HTML string. Definition at line 1334 of file HTMLForm.php. References as, getMessage(), and Html\rawElement(). Referenced by SpecialBlock\alterForm(), and getErrorsOrWarnings(). Put a form section together from the individual fields' HTML, merging it and wrapping. Definition at line 1774 of file HTMLForm.php. References $attribs, $html, Sanitizer\escapeIdForAttribute(), getDisplayFormat(), and Html\rawElement(). Get the value for the action attribute of the form. Definition at line 1900 of file HTMLForm.php. References $mAction, ContextSource\getConfig(), getMethod(), getTitle(), and wfScript(). Get the whole body of the form. Definition at line 1275 of file HTMLForm.php. Get the submit and (potentially) reset buttons. Definition at line 1166 of file HTMLForm.php. References $attribs, $mSubmitID, $mSubmitName, array(), as, Html\element(), ContextSource\getConfig(), getMessage(), ContextSource\getRequest(), getSubmitText(), ContextSource\msg(), Title\newMainPage(), null, Html\rawElement(), Xml\submitButton(), text, and Linker\tooltipAndAccesskeyAttribs(). Get the HTMLFormField subclass for this descriptor. The descriptor can be passed either 'class' which is the name of a HTMLFormField subclass, or a shorter 'type' which is an alias. This makes sure the 'class' is always set, and also is returned by this function for ease. Definition at line 465 of file HTMLForm.php. Definition at line 445 of file HTMLForm.php. Referenced by displaySection(), and formatSection(). Format and display an error message stack. Definition at line 1288 of file HTMLForm.php. Returns a formatted list of errors or warnings from the given elements. string | array | Status $elements The set of errors/warnings to process. string $elementsType Should warnings or errors be returned. This is meant for Status objects, all other valid types are always considered as errors. Definition at line 1301 of file HTMLForm.php. References formatErrors(), ContextSource\getOutput(), list, and Html\rawElement(). Referenced by getErrors(), and getHTML(). Definition at line 393 of file HTMLForm.php. Definition at line 881 of file HTMLForm.php. References $mFooter, $section, and null. Referenced by displaySection(), PreferencesFormOOUI\getBody(), and getHTML(). Get HTML attributes for the <form> tag. Definition at line 1080 of file HTMLForm.php. References $attribs, $mAutocomplete, $mId, $mName, getAction(), getMethod(), and needsJSForHtml5FormValidation(). Referenced by OOUIHTMLForm\wrapForm(), and wrapForm(). Definition at line 826 of file HTMLForm.php. References $mHeader, $section, and null. Referenced by displaySection(), and getHTML(). Get the hidden fields that should go inside the form. Definition at line 1132 of file HTMLForm.php. References $attribs, $data, $html, $value, as, ContextSource\getConfig(), getMethod(), getTitle(), ContextSource\getUser(), Html\hidden(), list, and null. Returns the raw HTML generated by the form. Definition at line 1044 of file HTMLForm.php. References $html, $mPost, getBody(), getButtons(), getErrorsOrWarnings(), getFooterText(), getHeaderText(), getHiddenFields(), ContextSource\getOutput(), and wrapForm(). Get a string to go in the "<legend>" of a section fieldset. Override this if you want something more complicated. Definition at line 1873 of file HTMLForm.php. Definition at line 1941 of file HTMLForm.php. Referenced by formatErrors(), OOUIHTMLForm\getButtons(), getButtons(), and OOUIHTMLForm\getErrorsOrWarnings(). Definition at line 1648 of file HTMLForm.php. Referenced by getAction(), getFormAttributes(), getHiddenFields(), and tryAuthorizedSubmit(). Get the introductory message HTML. Definition at line 775 of file HTMLForm.php. Get the text for the submit button, either customised or a default. Definition at line 1411 of file HTMLForm.php. Referenced by OOUIHTMLForm\getButtons(), VFormHTMLForm\getButtons(), and getButtons(). Definition at line 1626 of file HTMLForm.php. 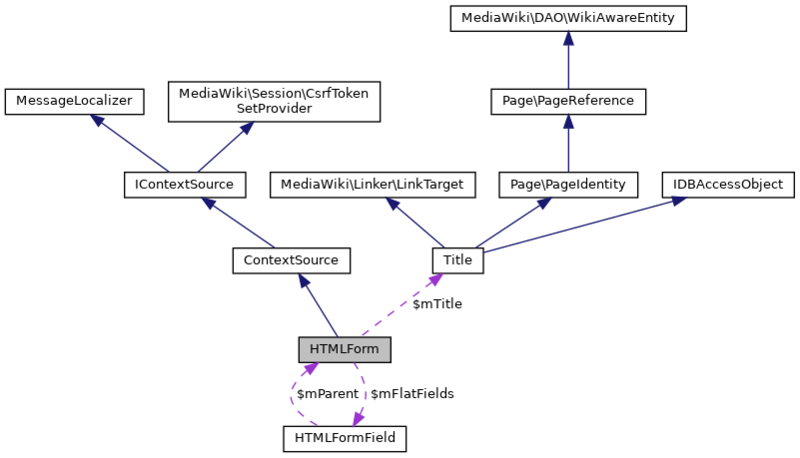 Referenced by UploadForm\__construct(), getAction(), PreferencesFormOOUI\getButtons(), getHiddenFields(), and MediaWiki\Preferences\DefaultPreferencesFactory\submitForm(). Definition at line 384 of file HTMLForm.php. Construct the form fields from the Descriptor array. Definition at line 1816 of file HTMLForm.php. References $name, $request, $value, as, and ContextSource\getRequest(). Definition at line 493 of file HTMLForm.php. Referenced by HTMLFormFieldCloner\createFieldsForKey(), ApiOptions\execute(), HTMLFormFieldCloner\getCreateButtonHtml(), HTMLFormFieldCloner\getDeleteButtonHtml(), and MediaWiki\Preferences\DefaultPreferencesFactory\loadPreferenceValues(). Definition at line 1954 of file HTMLForm.php. When doing method chaining, that should be the very last method call before displayForm(). Definition at line 518 of file HTMLForm.php. References ContextSource\getRequest(), loadData(), and null. Set the value for the action attribute of the form. When set to false (which is the default state), the set title is used. Definition at line 1887 of file HTMLForm.php. Set the value for the autocomplete attribute of the form. A typical value is "off". When set to null (which is the default state), the attribute get not set. Definition at line 1929 of file HTMLForm.php. Sets the target where the user is redirected to after clicking cancel. Definition at line 1505 of file HTMLForm.php. Definition at line 1070 of file HTMLForm.php. Set format in which to display the form. Definition at line 410 of file HTMLForm.php. Set footer text, inside the form. Definition at line 864 of file HTMLForm.php. Set an internal identifier for this form. If you use two or more forms on one page, it allows HTMLForm to identify which of the forms was submitted, and not attempt to validate the other ones. If you use checkbox or multiselect fields inside a form using the GET method, it allows HTMLForm to distinguish between the initial page view and a form submission with all checkboxes or select options unchecked. Definition at line 1466 of file HTMLForm.php. Set header text, inside the form. Definition at line 809 of file HTMLForm.php. Referenced by SpecialPasswordReset\alterForm(), and SpecialBlock\alterForm(). Definition at line 1530 of file HTMLForm.php. Referenced by UploadForm\__construct(), SpecialChangeEmail\alterForm(), SpecialBotPasswords\alterForm(), and McrUndoAction\alterForm(). Set the introductory message, overwriting any existing message. Definition at line 735 of file HTMLForm.php. Set the prefix for various default messages. Currently only used for the "<fieldset>" legend on forms with multiple sections; should be used elsewhere? Definition at line 1603 of file HTMLForm.php. Set the method used to submit the form. Definition at line 1639 of file HTMLForm.php. Referenced by SpecialChangeContentModel\alterForm(), and SpecialRedirect\alterForm(). Definition at line 1540 of file HTMLForm.php. Set text at the end of the display. Definition at line 909 of file HTMLForm.php. Set the introductory message HTML, overwriting any existing message. Definition at line 749 of file HTMLForm.php. Set a callback to a function to do something with the form once it's been successfully validated. Definition at line 708 of file HTMLForm.php. Definition at line 1369 of file HTMLForm.php. Referenced by SpecialPasswordReset\alterForm(), SpecialBlock\alterForm(), and SpecialResetTokens\alterForm(). Set the id for the submit button. Definition at line 1445 of file HTMLForm.php. Definition at line 1420 of file HTMLForm.php. Referenced by UploadForm\__construct(), and McrUndoAction\alterForm(). Identify that the submit button in the form has a progressive action. since 1.32, No need to call. Submit button already has a progressive action form. Definition at line 1383 of file HTMLForm.php. Set the text for the submit button. Definition at line 1357 of file HTMLForm.php. Referenced by UploadForm\__construct(), and setSubmitTextMsg(). Definition at line 1398 of file HTMLForm.php. Referenced by UnwatchAction\alterForm(), SpecialChangeContentModel\alterForm(), RollbackAction\alterForm(), WatchAction\alterForm(), RevertAction\alterForm(), MarkpatrolledAction\alterForm(), PurgeAction\alterForm(), SpecialRandomInCategory\alterForm(), SpecialPasswordReset\alterForm(), SpecialChangeEmail\alterForm(), SpecialBlock\alterForm(), SpecialPageLanguage\alterForm(), SpecialResetTokens\alterForm(), SpecialRedirect\alterForm(), and McrUndoAction\alterForm(). Definition at line 1431 of file HTMLForm.php. Set the id of the \<table\> or outermost \<div\> element. Definition at line 1519 of file HTMLForm.php. Referenced by SpecialChangeEmail\alterForm(), and SpecialBotPasswords\alterForm(). Set the title for form submission. Definition at line 1616 of file HTMLForm.php. Set the salt for the edit token. Only useful when the method is "post". Definition at line 1014 of file HTMLForm.php. Referenced by RollbackAction\alterForm(), WatchAction\alterForm(), RevertAction\alterForm(), and MarkpatrolledAction\alterForm(). Set a message to display on a validation error. Definition at line 722 of file HTMLForm.php. Use is discouraged, and should only be used where support for gadgets/user scripts is warranted. Definition at line 1570 of file HTMLForm.php. Prompt the whole form to be wrapped in a "<fieldset>", with this text as its "<legend>" element. string | bool $legend If false, no wrapper or legend will be displayed. If true, a wrapper will be displayed, but no legend. If a string, a wrapper will be displayed with that string as a legend. The string will be escaped before being output (this doesn't support HTML). Definition at line 1557 of file HTMLForm.php. Referenced by SpecialUnlockdb\alterForm(), SpecialLockdb\alterForm(), and setWrapperLegendMsg(). Prompt the whole form to be wrapped in a "<fieldset>", with this message as its "<legend>" element. Definition at line 1585 of file HTMLForm.php. Referenced by McrRestoreAction\alterForm(), UnwatchAction\alterForm(), RollbackAction\alterForm(), WatchAction\alterForm(), RevertAction\alterForm(), PurgeAction\alterForm(), SpecialBotPasswords\alterForm(), and McrUndoAction\alterForm(). The here's-one-I-made-earlier option: do the submission if posted, or display the form with or without funky validation errors. bool|Status Whether submission was successful. Definition at line 579 of file HTMLForm.php. References displayForm(), prepareForm(), and tryAuthorizedSubmit(). Same as self::show with the difference, that the form will be added to the output, no matter, if the validation was good or not. Definition at line 597 of file HTMLForm.php. Show a cancel button (or prevent it). The button is not shown by default. Definition at line 1494 of file HTMLForm.php. This implies that an alternate submit method must be provided manually. Definition at line 1482 of file HTMLForm.php. Referenced by SpecialResetTokens\alterForm(), and SpecialBotPasswords\alterForm(). Stop a reset button being shown for this form. Definition at line 1846 of file HTMLForm.php. Try submitting, with edit token check first. Definition at line 541 of file HTMLForm.php. References $mFormIdentifier, getMethod(), ContextSource\getRequest(), ContextSource\getUser(), null, and trySubmit(). Validate all the fields, and call the submission callback function if everything is kosher. Definition at line 618 of file HTMLForm.php. References $data, $mSubmitCallback, $res, as, filterDataForSubmit(), and StatusValue\newGood(). Test whether the form was considered to have been submitted or not, i.e. whether the last call to tryAuthorizedSubmit or trySubmit returned non-false. This will return false until HTMLForm::tryAuthorizedSubmit or HTMLForm::trySubmit is called. Definition at line 694 of file HTMLForm.php. Wraps the given $section into an user-visible fieldset. Definition at line 1661 of file HTMLForm.php. Wrap the form innards in an actual "<form>" element. string $html HTML contents to wrap. Definition at line 1114 of file HTMLForm.php. References $html, Xml\fieldset(), getFormAttributes(), and Html\rawElement(). Available formats in which to display the form. Definition at line 278 of file HTMLForm.php. Definition at line 289 of file HTMLForm.php. Format in which to display form. Definition at line 272 of file HTMLForm.php. Referenced by displaySection(), and getDisplayFormat(). Definition at line 222 of file HTMLForm.php. Definition at line 243 of file HTMLForm.php. Definition at line 247 of file HTMLForm.php. Definition at line 192 of file HTMLForm.php. Whether the HTML form IS collapsed by default. Definition at line 236 of file HTMLForm.php. Whether the HTML form can be collapsed. Definition at line 229 of file HTMLForm.php. Definition at line 137 of file HTMLForm.php. Definition at line 187 of file HTMLForm.php. Definition at line 185 of file HTMLForm.php. Definition at line 199 of file HTMLForm.php. Definition at line 212 of file HTMLForm.php. Definition at line 198 of file HTMLForm.php. Definition at line 246 of file HTMLForm.php. Definition at line 203 of file HTMLForm.php. Definition at line 182 of file HTMLForm.php. Definition at line 214 of file HTMLForm.php. Definition at line 204 of file HTMLForm.php. Definition at line 202 of file HTMLForm.php. Definition at line 197 of file HTMLForm.php. Definition at line 201 of file HTMLForm.php. Definition at line 200 of file HTMLForm.php. Definition at line 191 of file HTMLForm.php. Definition at line 188 of file HTMLForm.php. Definition at line 189 of file HTMLForm.php. Definition at line 194 of file HTMLForm.php. Definition at line 190 of file HTMLForm.php. Definition at line 207 of file HTMLForm.php. Definition at line 208 of file HTMLForm.php. Definition at line 209 of file HTMLForm.php. Definition at line 210 of file HTMLForm.php. If true, sections that contain both fields and subsections will render their subsections before their fields. Subclasses may set this to false to render subsections after fields instead. Definition at line 265 of file HTMLForm.php. Definition at line 205 of file HTMLForm.php. Definition at line 213 of file HTMLForm.php. Salt for the edit token. Definition at line 256 of file HTMLForm.php. Definition at line 245 of file HTMLForm.php. Definition at line 195 of file HTMLForm.php. Definition at line 215 of file HTMLForm.php. Definition at line 250 of file HTMLForm.php. Definition at line 249 of file HTMLForm.php. Definition at line 135 of file HTMLForm.php. Referenced by AuthManagerSpecialPage\addTabIndex(), and HTMLExpiryField\getFieldByType().